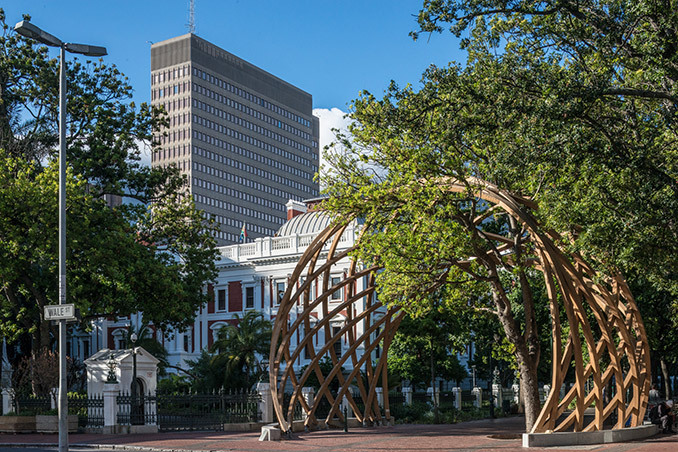 The Arch for Arch stands as a tribute to the human rights activist and Nobel Peace Prize Laureate Archbishop Desmond Tutu, affectionally known as “Arch” by fellow South Africans, as well as a monument to peace and democracy. 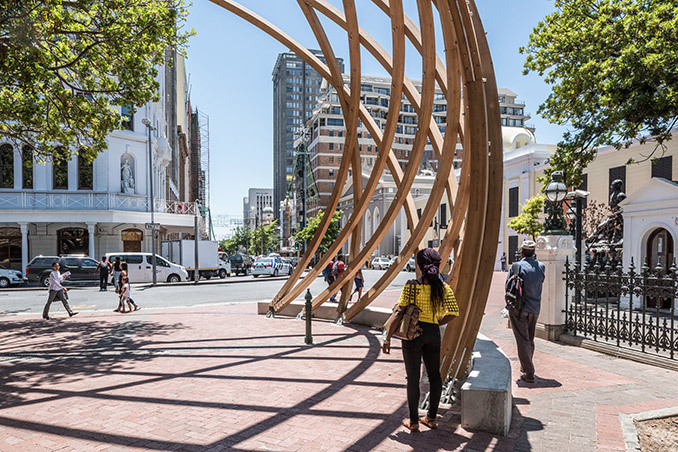 Designed by Snøhetta and Johannesburg-based Local Studio, in collaboration with Design Indaba, the engineers at Hatch, and generously supported by Liberty, the Arch marks the site where Tutu began many of his Anti-Apartheid protests in Cape Town. 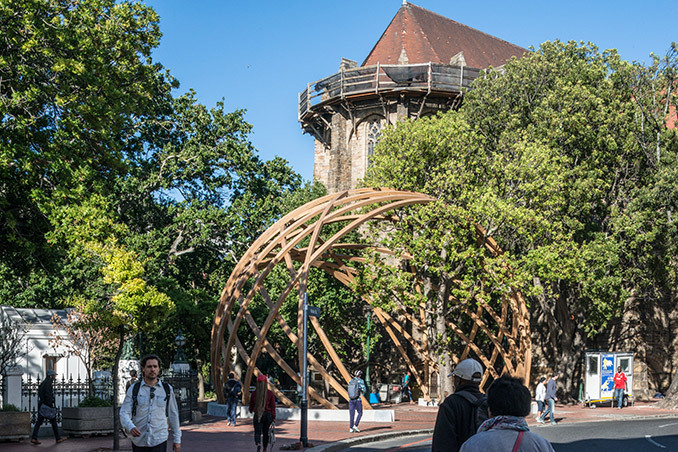 Situated between the Parliament and St. George’s Cathedral, the permanent wooden structure creates a new public space in the city’s downtown. The Arch’s significant location will stand as a constant reminder to lawmakers. 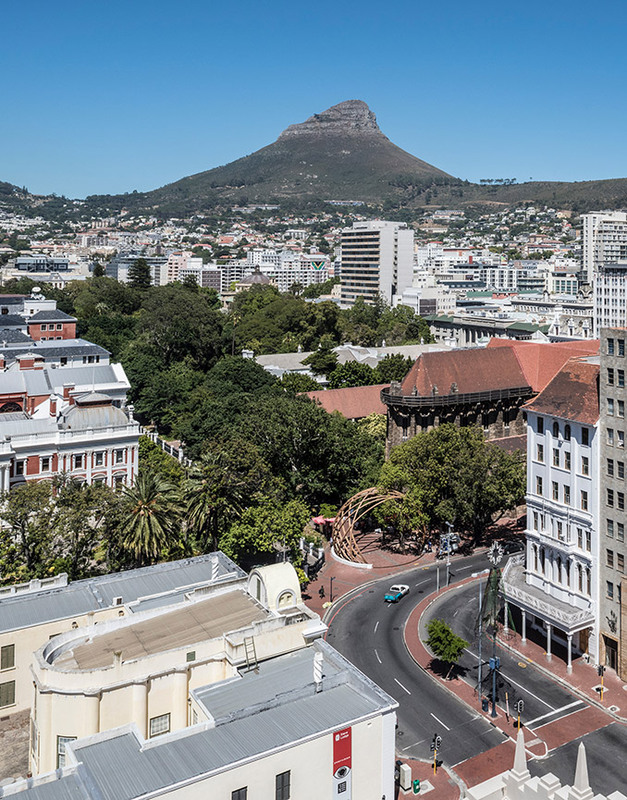 Its proximity to St. George’s Cathedral, which is the seat of the Archbishop of Cape Town, frames the public entrance to the Company’s Garden that has been in existence since 1652, and is the most popular walk for citizens accessing the cultural precinct of Cape Town. 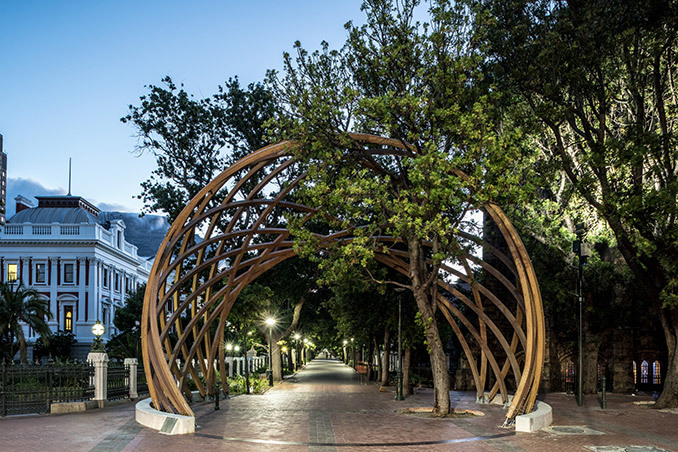 The Arch consists of 14 intertwined strands of bent wood, representing the 14 chapters of the South African constitution. 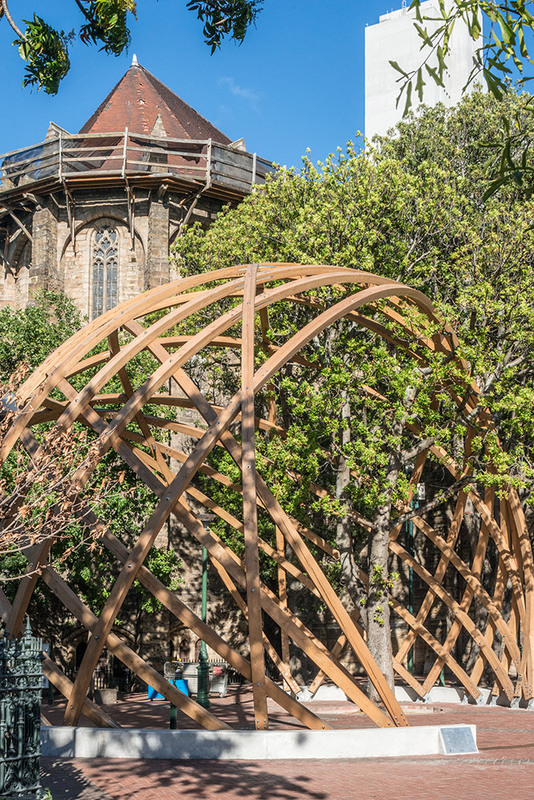 Together the arching wooden elements inscribe a globe, celebrating Archbishop Tutu’s role as a unifying figure for the international peace movement. At 9 meters tall, or nearly 3 stories high, the scale of the Arch envelops visitors as they pass underneath it. A traditional arch is supported by opposing forces pushing against one another, held together by a keystone. 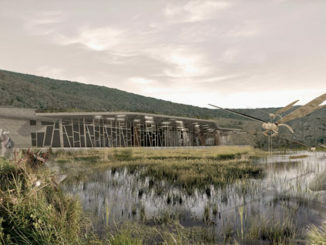 These structural properties emerged as a core concept for the design, where the Arch stands as a metaphor for the integrity of the country’s democracy whose conceptual keystone is the Constitution of South Africa. 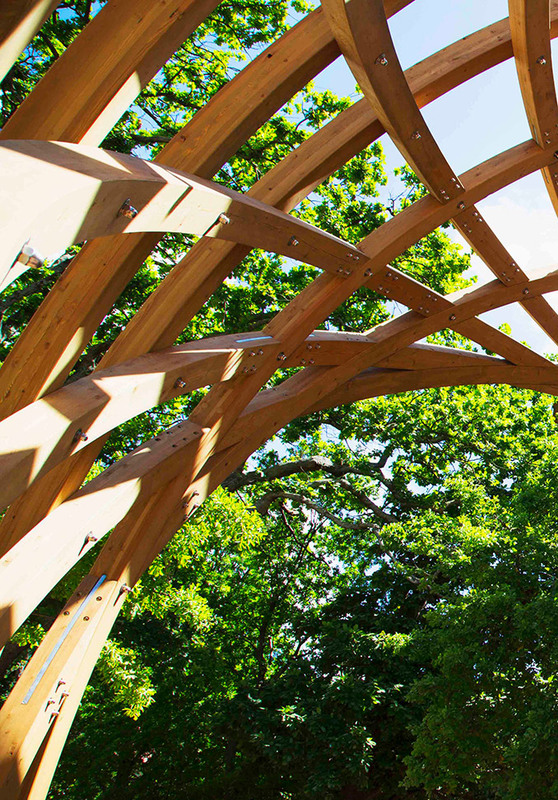 The Arch is made of Larch wood, a highly durable and resistant material that will weather gracefully over time, taking on the elements of its surroundings. 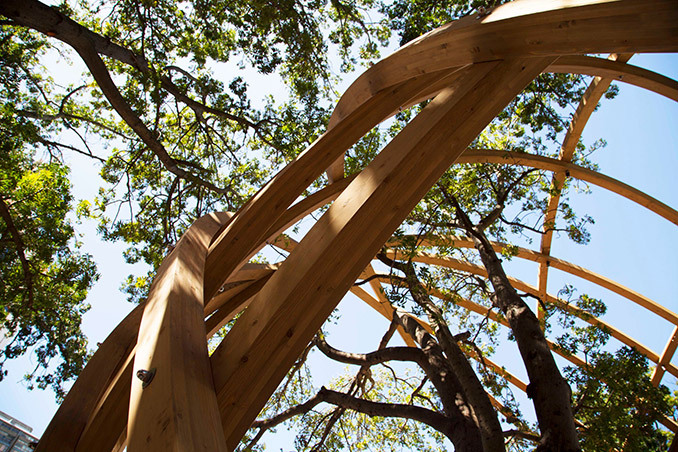 The warmth of wood was intentionally selected to lend the Arch an intimate, tactile quality that invites people to interact with the structure in a way that differs from the conventional materials people might expect for a memorial structure, such as concrete, steel, or stone. 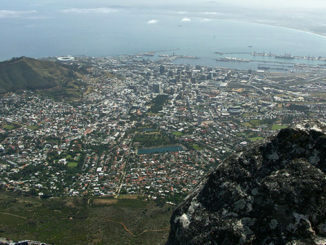 The Arch for Arch is more than a monument for Archbishop Tutu. It builds on the legacy of South Africa’s foremost campaigner for democracy to create a platform for public participation in upholding the Constitution. The Arch will stand as a permanent tribute to what was sacrificed in the pursuit of democracy, and the vital necessity of protecting these rights for generations to come. 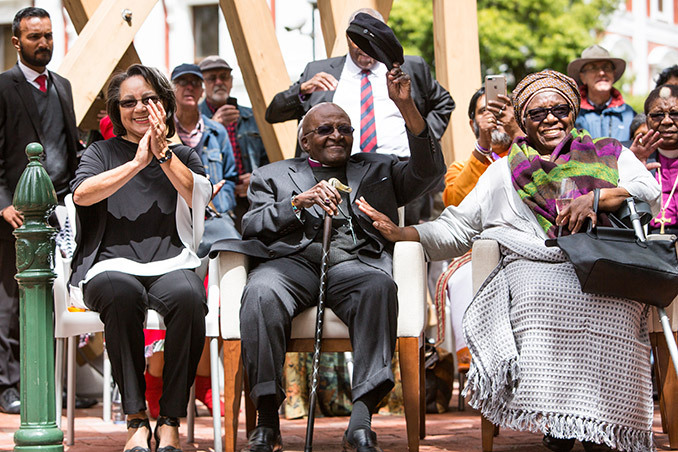 The first Arch was unveiled on the occasion of Archbishop Desmond Tutu’s 86th birthday on October 7, 2017. 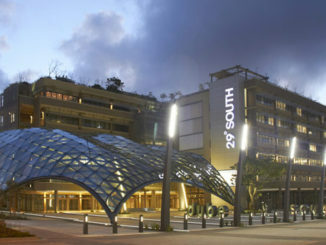 A second smaller Arch is now located on Constitution Hill in Johannesburg, where the Constitutional Court is located. Its unveiling took place December 10 to coincide with the 21st anniversary of the country’s Constitution.